In cahoots with some lovely and generous friends and family, I’ve bought Theo an Ashford Traveller spinning wheel for her birthday coming up this Sunday. It’s the double treadle, double drive model in natural wood. As it needs a finishing coat (I’m using Ashford’s own wax polish) and assembly, I’m going to try to get it up and running ready for the big day. Here’s the first, and arguably most exciting, stage – unpacking it! The box. 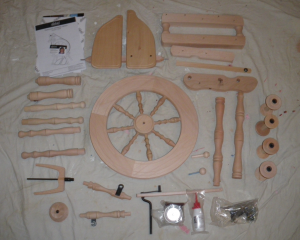 The wheel was supplied by alpacaspinner.co.uk and safely delivered by Parcelforce. 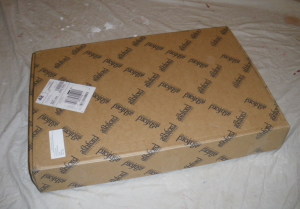 The box – opened, and with the top protective packing removed. 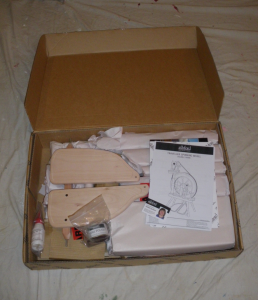 All the packing is paper or card, the only plastic is the bag that the screws and fixings are in. And that’s a re-usable ziploc. The contents – lots of wax polishing to do now. The polish is in the shiny tin at the bottom, next to the spinning wheel oil (nope, I’d never heard of that before either).